I’m excited to teach a beginner watercolour class at the Kelowna Art Gallery next month. This workshop is perfect for you if you have never tried watercolour painting, or maybe you have dabbled a little but never learned the basics. 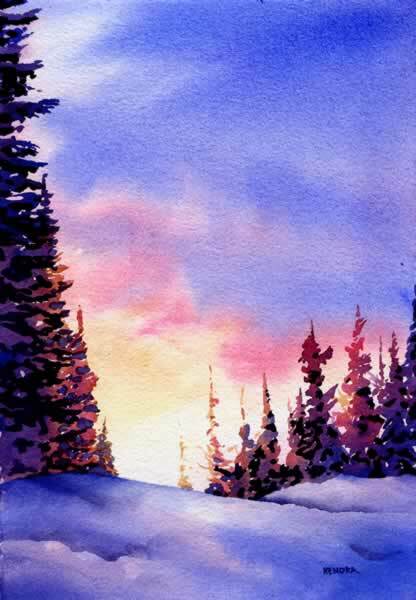 I’m going to go over the techniques and skills needed to develop a foundation of watercolour basics. Some of the things I’ll be going over are clear washes, textures, clouds, trees, mist, reflections in water, snow, and more. Here is a watercolour I painted in 3 washes plus some darker details. Sorry the typeface is so tiny. I truly love beautiful, inspiring sunsets, sunrises, botanicals and florals. The posted painting of yours is gorgeous, I can’t believe you’ve not done more work since 2012. I hope you have moved on and up. Life is so short. I’d say more, but don’t know how pinterest works. Do you have more current work in a gallery? On Pinterest?